Your life is a verb—how do you want to live it? This article was originally written for The Incubator. Feel free to read this article there and check out other great articles too! 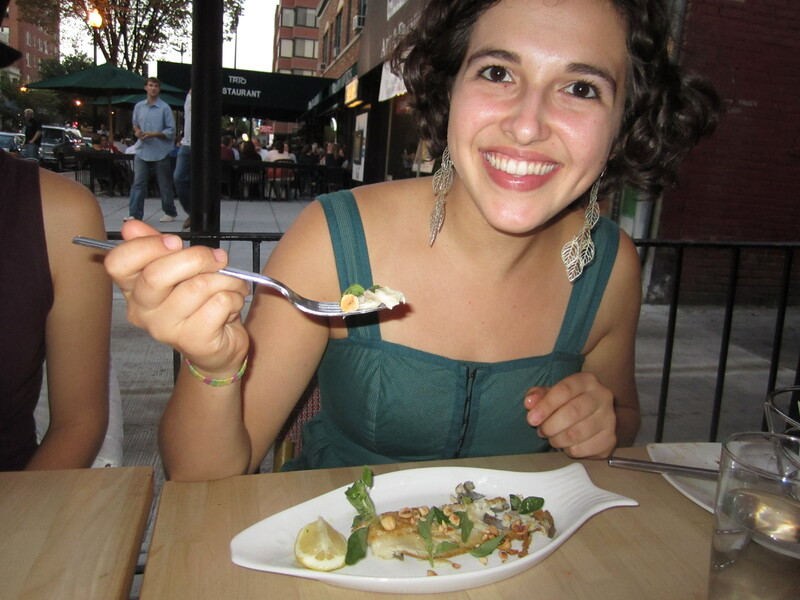 Although I have yet to participate in real restaurant week (something I think prevents me from being a true foodie), my roommates and I were thrilled to stumble upon the lesser-known Turkish Restaurant Week last weekend. Having made it through the first several weeks of school, we decided that the $25 four-course meal was the perfect way to treat ourselves. Turkish Restaurant Week is a much smaller affair than the traditional one, although no less delicious. Even though we only had seven restaurants to choose from, it still took us several hours to finally decide we were going to Agora in Dupont Circle. The menu looked like a great mix of tradition and innovation. Plus the small-plates style dining seemed like a great way to try a lot of different options. Now, in case you aren’t familiar with Turkish food, let me explain it to you like I did to my roommate: Turkey lies in between Greece and the Middle East, as does its food. For me, that means the perfect marriage between the food I was brought up eating (Lebanese) and one of my more recently discovered favorite cuisines (Greek). Plenty of pita, lamb, feta, yogurt, red peppers, phyllo dough, and chickpeas. And of course, gallons of olive oil. What could be better? When we arrived at Agora I could immediately tell I was going to like it. 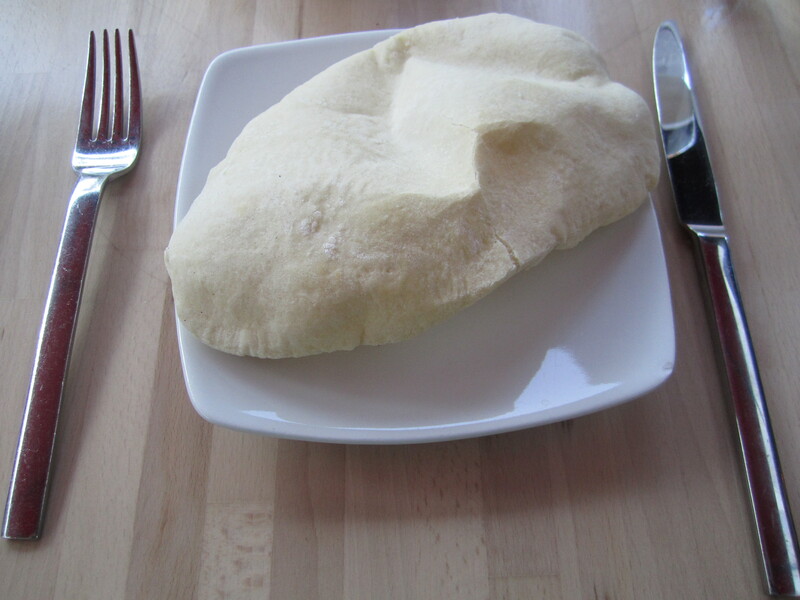 The meal started off with pita puffs: basically very thin, airy pita bread. It was warm from the oven, but we managed to save some of it to sop up the leftover sauce from our later courses. To start off, I ordered the Lebneh, a strained yogurt. 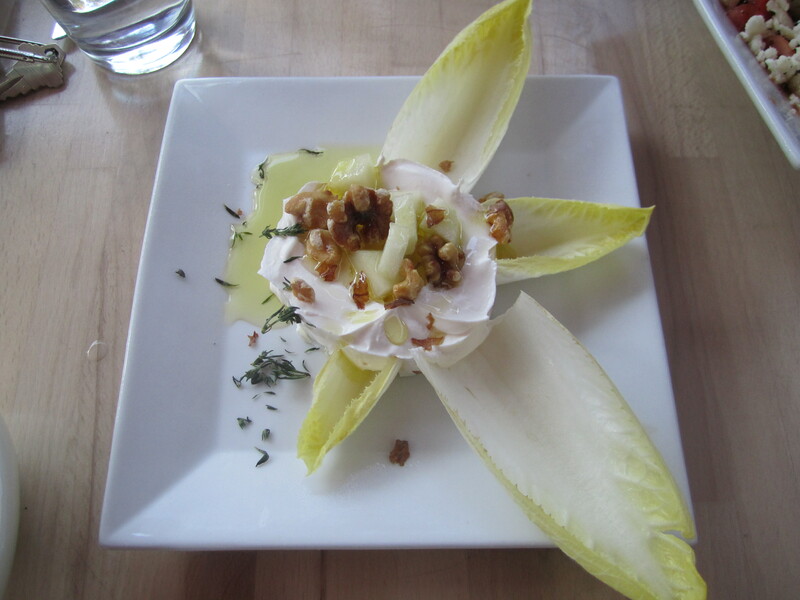 It came out with apples and walnuts, surrounded by endive leaves that could be used as scoops. The yogurt was thick and creamy, very similar to greek yogurt. 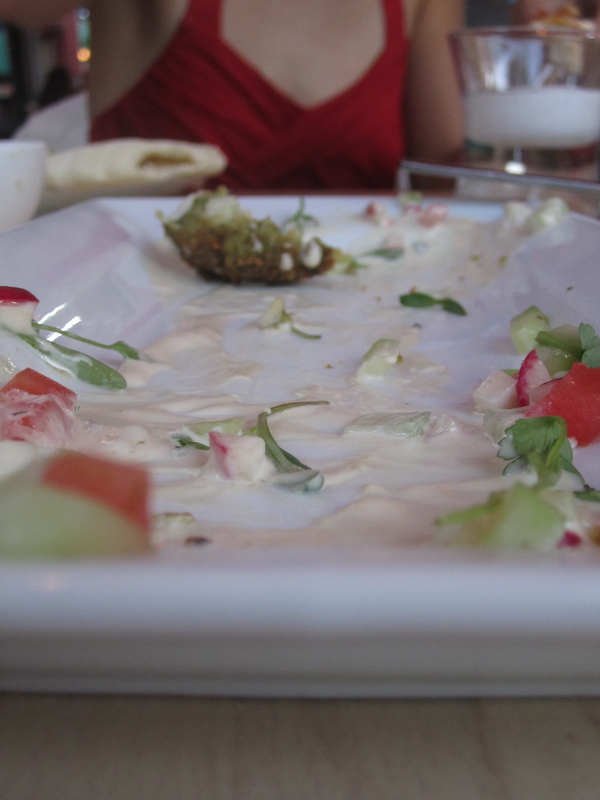 It was an interesting textural contrast between the smooth, heavy yogurt and the crunchy, light endive. The apples added a nice tartness. For the second course, I couldn’t decide between two options: the crab falafel and the chefs börek. Luckily, one of my roommates was facing the same predicament, so we decided to get one of each and split (the best way to eat out). The börek a thick phyllo roll stuffed with a goat cheese mixture and served with a side of tomato marmalade. The roll was delicious, but really how can you go wrong with that much goat cheese? But my favorite part was the marmalade. I was both sweet, tangy and had a surprising hint of cinnamon. I had high expectations for the falafel and was a little disappointed. Although the crab was a nice touch, the falafel was dry and the sauce that came with it was overpowering. If you’re looking for falafel, I’d stick to Amsterdam Falafelshop. As a mostly-vegetarian, I decided to order the Alabalık for my third course, a brook trout with roasted hazelnut and oregano. While the fish was good, my roommate’s Kibbeh was better. Kibbeh is a meat dish made with ground beef, lamb, bulgur (a grain) and pine nuts, all mixed together and baked like a Lebanese meat loaf. I grew up eating it, and so I decided to take the Big Fat Greek Wedding approach to vegetarianism (“You don’t eat meat? I’ll make you lamb.”) and have a taste. It was incredible. I decided to have another taste. And another. I don’t know if it was just nostalgia, or if it really was the best Kibbeh I’ve ever had. Finally, for dessert I ordered the Backlava, which they make orange-flavored instead of the traditional honey and nuts. I love Backlava, but I don’t like orange desserts so it wasn’t my favorite. All in all, I would recommend Agora if only for the delicious Kibbeh. Unfortunately, restaurant week is over now, but if you missed it don’t fret! Not only can you go to Agora anytime (their small plates run from about $8-$10), but the Turkish Festival this Sunday, October 3rd near Federal Triangle will have a food court featuring options from many D.C. restaurants. Happy eating! Watch ‘Guernica’ in the Kitchen! Throughout the video Gopnik talks to chef José Andrés about the food he serves, trying to address the question of whether food can be as unique and profound as radical contemporary art (such as Picasso’s Guernica, pictured at top of post). Chef Andrés sure believes so – during the interview he expresses his beliefs about food, emphasizing the fine line between food and art and suggesting that food should be able to push the boundaries of our mind just as much as a painting can. He states that the goal of the restaurant is not to “feed people,” but rather to “have a conversation” and help people learn about the world. He hopes that their ‘Guernica’, or revolution, is going to be changing the way people eat and think about food. The videographer uses almost all close ups or extreme close ups in this segment. This is done in order to help the viewer focus on the minute details that go into the preparation of the food, and then the eating of the food itself. This video also utilizes an interesting variation of split screen, where instead of having two shots showing at once, there are multiple shots spaced across the screen playing at the same time. This is effective in giving the viewer a feel of the energy in the restaurant. In a restaurant, especially in the kitchen, there is always movement, noise, ect – always many things going on at once. Having many things happening on the screen at once helps capture that for the viewer.